An amazing thing happened in Glenrothes — we had beautiful weather. Yesterday evening, we decided to go for a walk in the countryside (for those who know the area, we walked from Craigmead to John Knox’s Pulpit near West Lomond, about six miles return). It was sunny, clear, and warm, and even though we started fairly late, it never got cold. As we headed back, with the sun behind us, I noticed the shadows were lengthening, and the thought crossed my mind, “This wouldn’t be a problem, even if we are delayed and don’t get back before sunset.” It was open country, and the sky was clear, so even at night there would have been enough light to make our way along. Those thoughts led naturally to another memory, from a few weeks ago. In June, when we had guests with us, we decided to go down to northern England to show them the Lake District and Hadrian’s Wall. 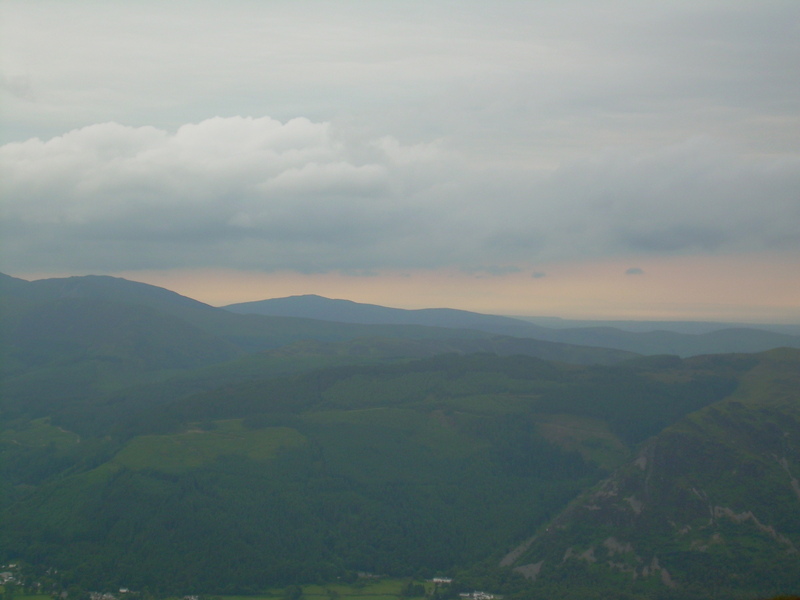 We didn’t get an early start, but decided, on our arrival, to climb Skiddaw in the Lake District, a peak of 931 metres (fourth highest in England). This wasn’t very smart. 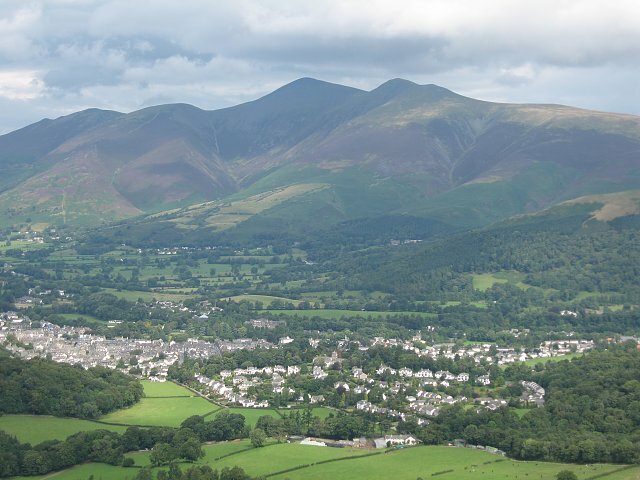 Skiddaw is beautiful, overlooking the famous town of Keswick. (I grabbed this picture from wikipedia). We started from the Bassenthwaite Lake side (rather than the saner path going over Little Man), which meant the terrain was very steep and very rocky in places. The weather was moderately cool (not bad for climbing, actually) but cloudy. We figured it was only about three miles to the top, and we didn’t get started until around 6:00 pm. If it is six miles, we should at worst be back by 9:00, maybe 9:30 if the path is rugged, right? The path was indeed rugged, really rugged. The weather wasn’t the best (you can see the clouds in the picture to the left) but not horrible. And even though I wasn’t really feeling up to such an ordeal, I was so fed up with being an invalid that I determined I would go with the other idiots brave souls all the way to the top. That’s one of the “benefits” of all my past distance running — you develop the mental training and strength to discipline yourself to do really stupid things. 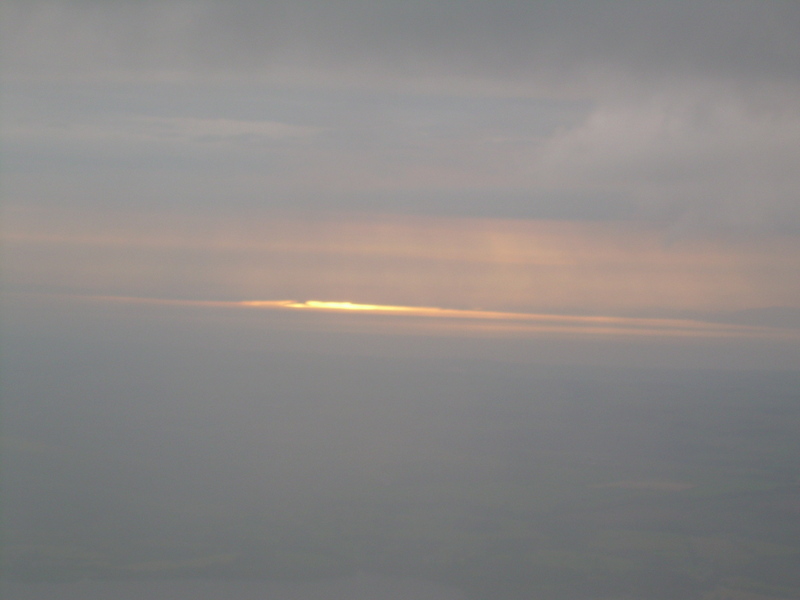 Even though it was cloudy, there were brilliant views, as the sun reflected off of the Solway Firth. (The picture is nice, but doesn’t really do it justice. You should have been there.) I may hurt all over, I may pay for this tomorrow, but this has been worth it, hasn’t it? Actually, though, that sun is getting a little low, isn’t it? I kind of wish we were on our way back down, instead of still on our way up. I don’t really want to be up here after dark, after all. That’s not a very good plan. And Peter won’t thank me for bringing his daughters up here with us if we get stranded, either. We’d better keep moving. As we neared the top, the clouds got lower, and some mist blew through. I began to seriously think, “This is NOT a good place to be if a fog settles in, especially if it gets dark.” But the top was near, so we pressed on. I began to encourage everyone that if we are really going to do this, we need to get a move on. Of course, everyone was tired by this time. Take short breaks if we have to, but keep moving. Did I mention that starting this climb in the evening was a stupid idea? I hope we can get mobile phone reception up here if someone gets hurt, because by the time someone hikes down for help, it’s going to be dark, cold, wet, and ugly. I wish the clouds weren’t so low. At least the sun is still peeking through out there on the firth and reflecting some light up here. This is really, really NOT a good place to be in the dark. We could get lost up here in the dark. The path isn’t always that obvious. We won’t get THAT lost, we’ll eventually find our way down, but everyone is already tired. If it really gets dark, someone will twist an ankle on these rocks, or slide on the loose slate and get cut up. That’s even if it isn’t foggy, and well, it IS getting foggy. We really need to be off this hill before the sun sets. Why are we up here, anyway? What kind of person intentionally puts himself and his family in this kind of situation? And by the way, everyone’s getting a little hungry, too. This is NOT a good place to be after sunset. We made it down. No one fell off a cliff or broke a neck, or even a fingernail. It wasn’t quite dark at 10:00 pm when we made it back to the cars, and the fog never really settled, either. Everything was fine, even if we were a little hungry and a lot tired and sore. But I determined that I would never take on a hike like that without plenty of margin for error. You simply don’t want to be in a place like that when the sun sets. 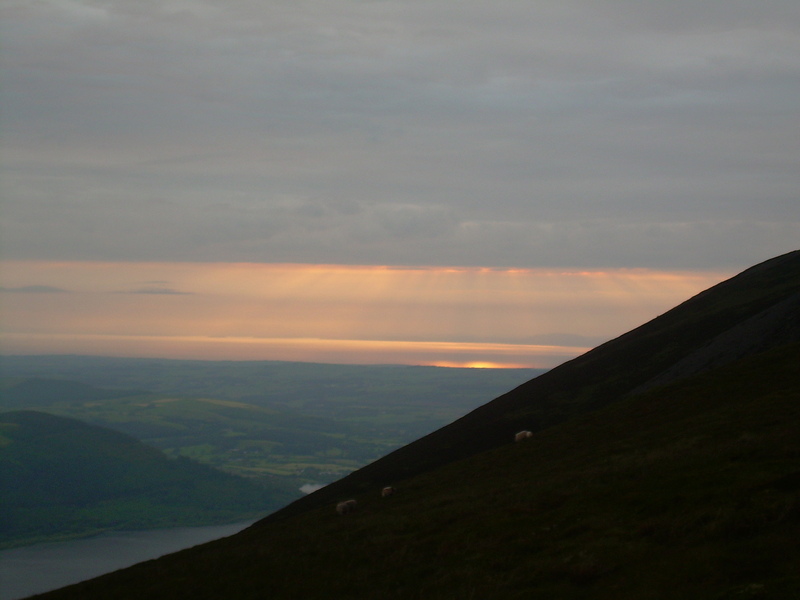 So yesterday evening, as we neared the car (with plenty of daylight), I remembered our climb of Skiddaw, and a Scripture passage came to mind (yes, I do have a point to all of this rambling). “Be ye angry, and sin not: let not the sun go down upon your wrath” (Ephesians 4:26). How can we be angry and not sin? A lot has been said on this subject, and I won’t reinvent the wheel. This part of the verse isn’t my focus in this post, anyway. But perhaps a good test would be to ask, “Am I as angry at my own sins as I am at his?” If not, then we’ve established that our anger isn’t really righteous anger, because true righteousness doesn’t decide that I’m better than someone else, or that my sin is less important. It was the second part of the verse that came to mind last night. 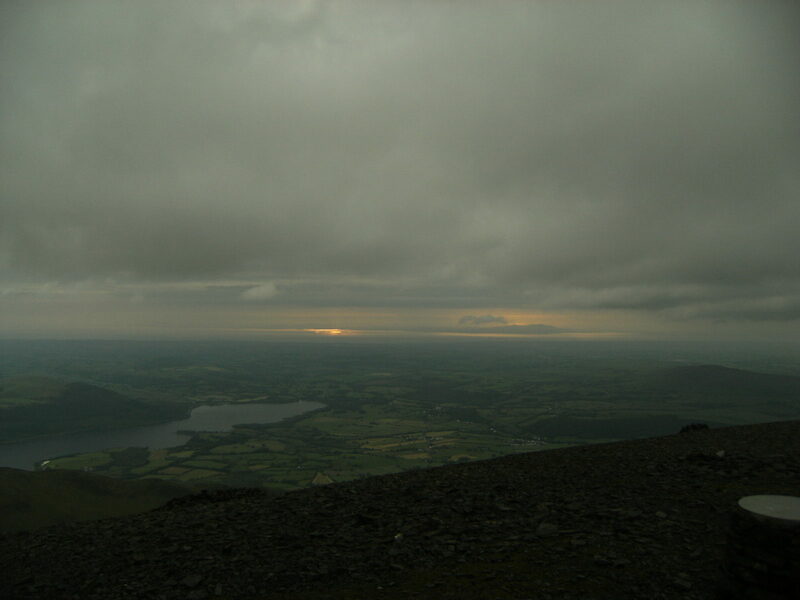 I was thinking about the fact that the top of Skiddaw is NOT a good place to be once the sun goes down. This verse is telling me that if the sun sets while you are in the grip of wrath, that is not a good place to be, either. Skiddaw is a treacherous place if you can’t see clearly where you are going, and when rage takes hold of us, we can’t see where we are going, either. It’s a very, very dangerous place to be. Sin fills our heart, and pours out of our lips. When wrath or rage takes control, we’ll go anywhere and do any stupid and evil thing. Let all bitterness, and wrath, and anger, and clamour, and evil speaking, be put away from you, with all malice: And be ye kind one to another, tenderhearted, forgiving one another, even as God for Christ’s sake hath forgiven you. There are worse places to be than Skiddaw, even after the sun goes down, even if the mist settles and you can’t see very far. But there aren’t many worse places to be than holding onto rage. It blinds you worse than any physical darkness, and will lead you down many wrong paths, near treacherous cliffs and ferocious torrents that would sweep you to destruction. If you are holding to your wrath, it is rather holding you, driving you in the mist and the darkness towards an abyss. It is NOT a good place to be. With a renewed mind, as you are putting on the new man, start a new day, and put your wrath away from you. Do it now. 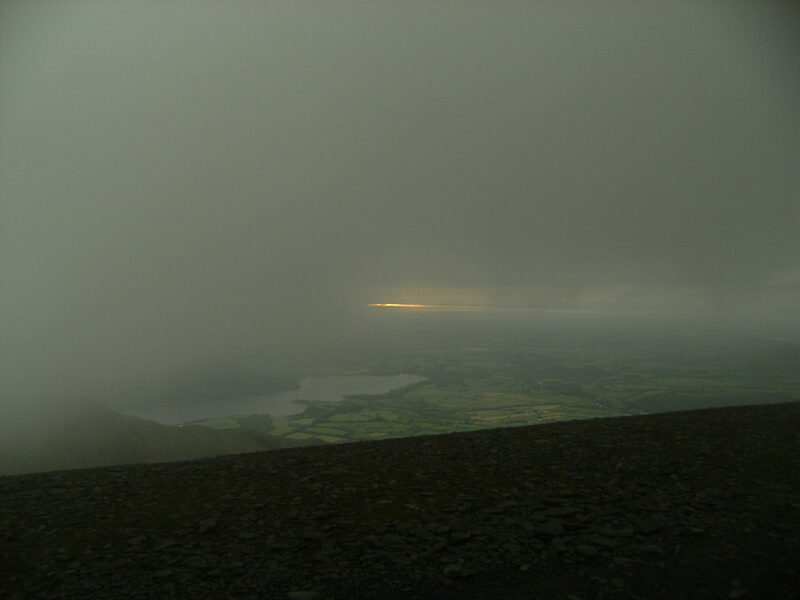 Gallery | This entry was posted in Daily Christianity and tagged anger, Forgiveness, skiddaw, sunset, wrath. Bookmark the permalink. Thanks for a great post…good to know the story behind all the beautiful photos I saw on Facebook, and an effective object lesson as well! 🙂 I’m the best person in the world to make fun of, because I’ve given myself so much “ammunition” to do so over the years, and I’m a target that is hard to miss.